In 2012, the Canadian NASCAR series was in its sixth season. 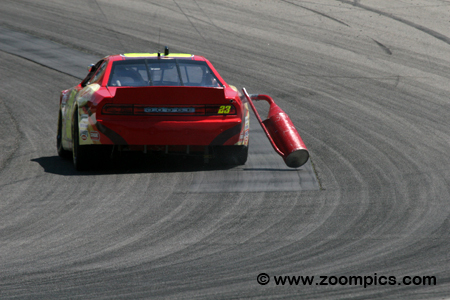 With Canadian Tire as the primary sponsor, NASCAR had developed a successful format that attracted competitors and fans. There were some changes to the 2012 schedule – mainly the order of the race weekends early in the season. The title chase started on the Victoria Day Weekend at Canadian Tire Motorsport Park (CTMP). There would be an additional event held at this facility – a race on the oval track in June. 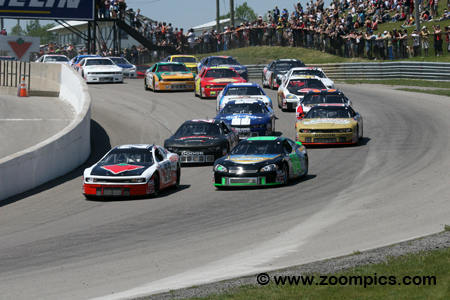 The championship would end in late September at Kawartha Speedway. A significant change saw the high-profile event at Toronto’s Exhibition place dropped from the calendar. It was replaced with a temporary circuit in Edmonton. In total, there was twelve race weekends and the series would visit twelve different tracks in six provinces. The cars competing in the championship are constructed to specifications and rules common to most stock car series. The chassis is a steel tube frame design covered with a fiberglass body and is required to weigh no less than 3000-lbs. Body styles are from manufacturers such as Dodge (Avenger, Challenger and Charger), Ford (Fusion) and Chevrolet (Monte Carlo and Impala SS). Engine type and displacement are dictated by the make and model of the vehicle. The carbureted eight-cylinder motors produce approximately 650-horsepower. Depending on the gearing, these cars are estimated to have a top speed of 160-mph. The first event of the 2012 season, the Vortex Brake Pads 200, would be fifty-one laps (201.8 kilometers) around Canadian Tire Motorsport Park’s ten-turn 2.459-mile road course. 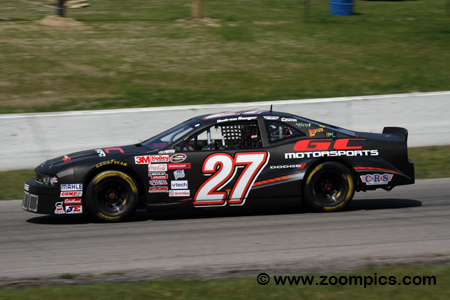 Twenty-seven competitors started the opening round of the NASCAR Canadian Tire Series at Canadian Tire Motorsport Park. Leading the field into corner one is Scott Steckly driving the Canadian Tire Dodge Challenger. Next to Steckly, is the Chevrolet Impala SS of the second fastest qualifier, J.R. Fitzpatrick. Behind the front row are the third and fourth place starters, Andrew Ranger and D.J. Kennington. 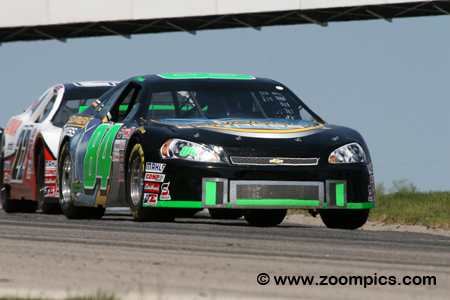 Qualifying second quickest was J.R. Fitzpatrick driving the Equipment Express sponsored Chevrolet Impala SS. Fitzpatrick led the first fifteen laps of the race. He moved to the front for the last time on lap-45 and despite a challenge from D.J. Kennington in the Castrol Edge Dodge Challenger, Fitzpatrick held on for the win. This ended a twenty-race ‘dry spell’; his last victory was at Edmonton in July 2010. The reigning NASCAR Canadian Tire Series champion, Scott Stecky recorded the fastest time in qualifying. Although he was on the pole, Steckly was unable to hold off the second place starter, J.R. Fitzpatrick and surrendered the lead before the first lap. However, the driver of the Canadian Tire Dodge was able to remain in contention and challenged J.R. Fitzpatrick and D.J. Kennington but settled for third place. Starting fourth was the defending race winner and 2010 series champion, D.J. Kennington. On lap-44 of the race, Kennington was leading in the No. 17 Castrol Edge/Mahindra sponsored Dodge Challenger when he was passed by J.R. Fitzpatrick. Kennington tried to pass the race leader but was unable to take the position. He claimed the runner-up position just 0.338-seconds behind Fitzpatrick. 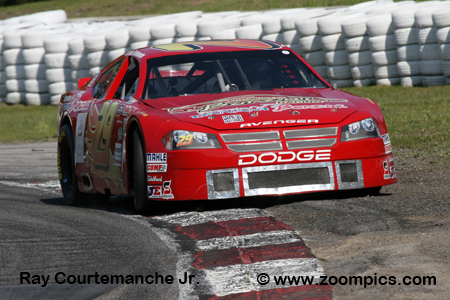 L.P. Dumoulin had competed in the NASCAR Canadian Tire Series on a part-time basis since 2009. In 2012, he obtained the funding to enter all twelve events. The former open-wheel racer was at home on the CTMP road course. Dumoulin clocked the tenth quickest time in the qualifying session. Driving the No. 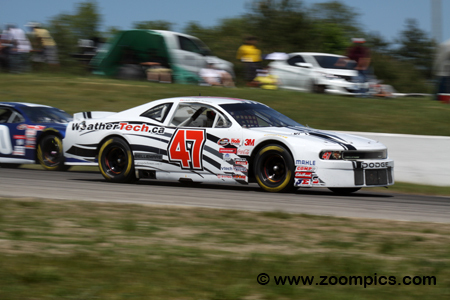 47 WeatherTech Canada/Bellemare Dodge Challenger, he made good progress during the contest and finished fifth. 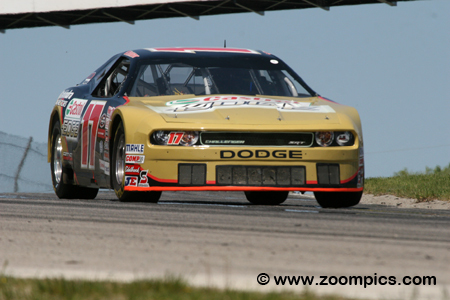 The two-time race winner at Canadian Tire Motorsport Park, Andrew Ranger qualified third quickest driving the No. 27 Dodge Challenger with sponsorship from Mopar. Ranger was one of six drivers to lead a lap. He moved into the top spot after the first round of stops but lost the position to Ron Beauchamp, Jr. During the race, Ranger gave up a position to D.J. Kennington and finished fourth. Despite carrying this extra ballast during the round one at Canadian Tire Motorsport Park, Jeff Lapcevich managed to finish in the eighth position. Lapcevich drove the No. 23 Dodge Challenger with backing from his long-time sponsor, Tim Hortons. For the start of the contest, he was gridded in ninth position and other than the issue with the gas can, Lapcevich turned in a solid performance. In last year’s Vortex Brake Pads 200 at Canadian Tire Motorsport Park, Jason Hathaway finished twenty-first after an accident on lap-41. Starting in the sixth grid position this year, his fortunes would change. 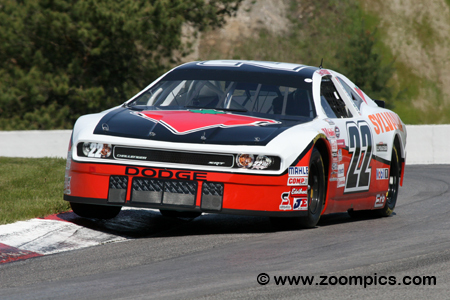 Driving the Ed Hakonson owned Dodge Challenger, Hathaway drove a steady race and finished in the sixth position. As to be expected, Kerry Micks demonstrated his versatility in the opening round. Micks’ roots go back to the oval tracks but he is always quick on the road courses – he has victories at Montreal and Trois-Rivieres. 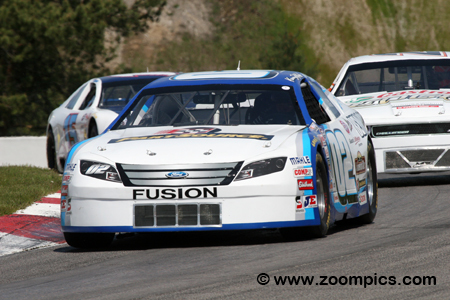 At Canadian Tire Motorsport Park, Micks qualified seventh fastest in the Leland/Beyond Digital Image/PartSource Ford Fusion. At the checkered flag, he was in seventh place.